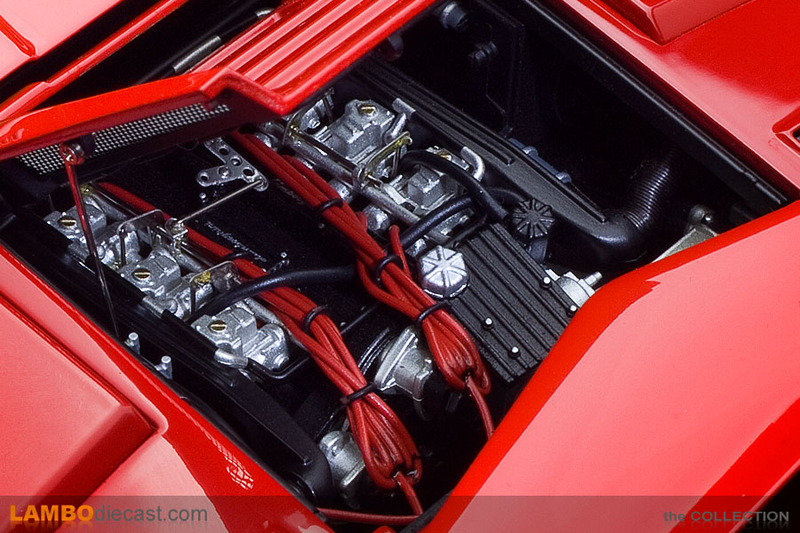 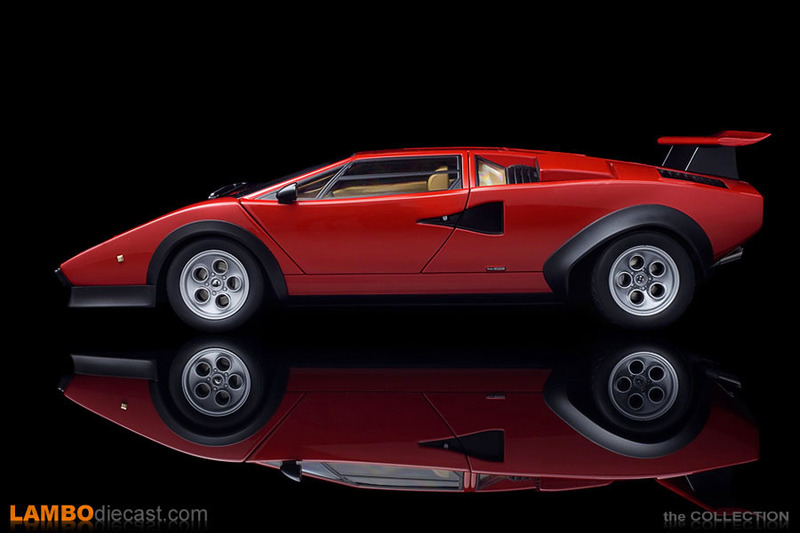 In the early Seventies, the Lamborghini Countach was the car to be seen in among the rich and famous, and Walter Wolf was among the richest of them all, having his own Formula One racing team when he arrived on the paddock, it just had to be behind the wheel of a Countach. 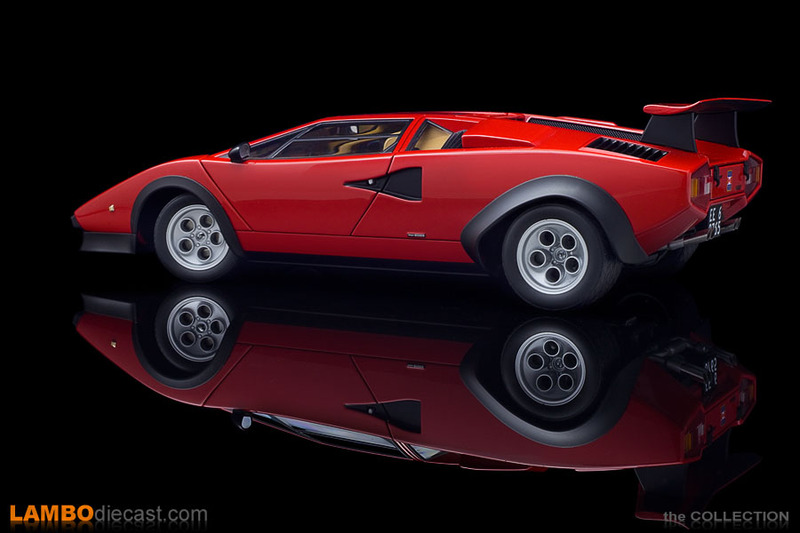 His first Lamborghini Countach was a rather standard looking, white over black finished LP400 model, but Walter Wolf got the idea the tires were too narrow and the car had too much power to handle correctly, so he added a roof mounted wing inspired by his racing team, that car would become the first 'Walter Wolf Special' although the factory had little to do with this customization. 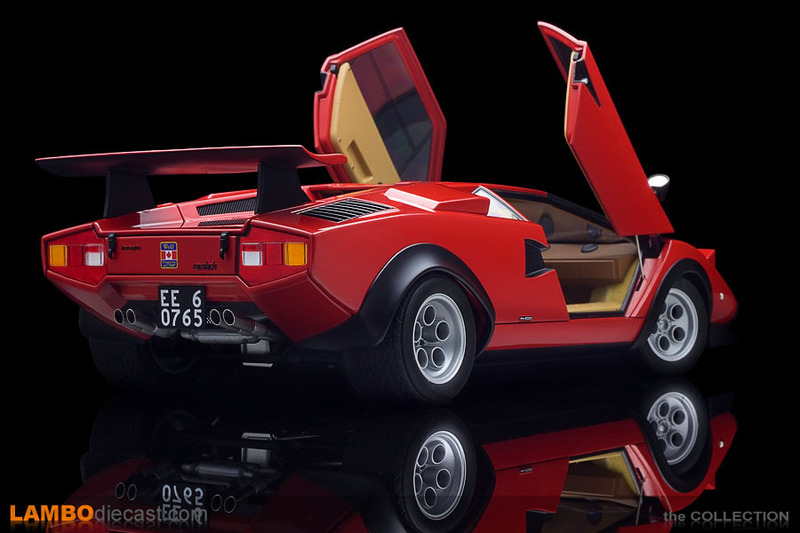 Walter Wolf was the kind of guy that didn't collect cars, he like cars and owned a lot of them at any given time, but he usually replaced them after one or two years, so his white Countach LP400 was replaced by the first heavily modified WW Special, this 1975 LP400 with chassis #1120148 was finished in red over a tan interior and none other than Lamborghini chief engineer Gian Paolo Dallara was asked by Walter Wolf personally to customize to his likings. 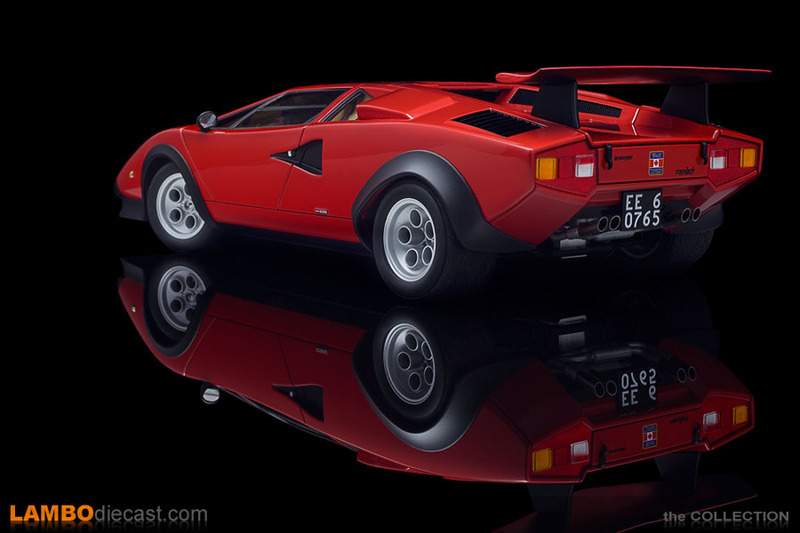 Walter Wolf contacted his Formula One tire supplier, Pirelli, to come up with a massive rear tire for 'his' custom Countach, they ended up with a 335mm wide piece of rubber made specifically for Walter Wolf, just imagine the cost of these, also note the Countach LP400 S would later come with even wider tires at 345mm, so not the same as this first Walter Wolf Countach. 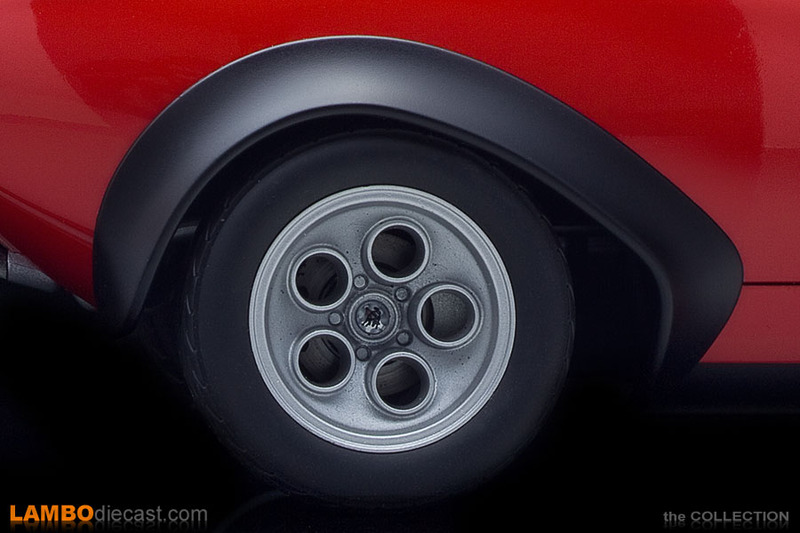 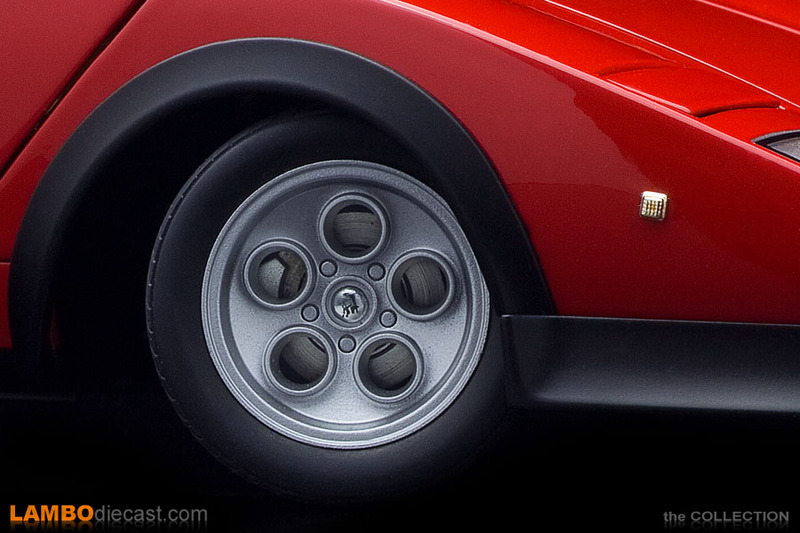 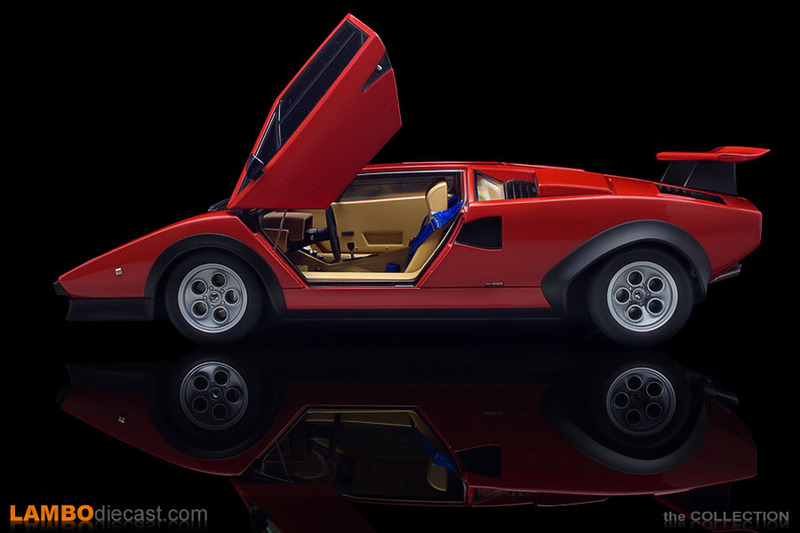 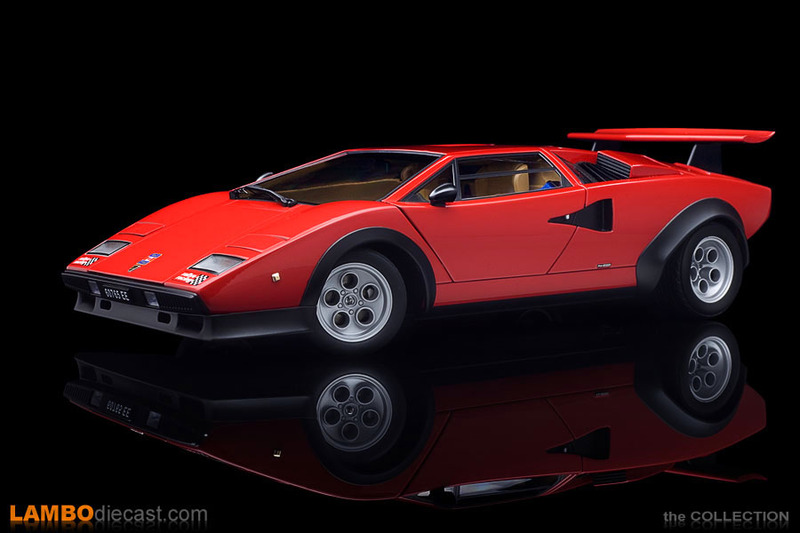 Wolf convinced the factory to install those stunning Silhouette style wheels on his first Countach (they would later be used on the actual production Countach LP400 S too) and Dallara had to come up with a new suspension geometry for this red Countach, those massive rear tires only made sense if the suspension was able to keep them as flat as possible in corners ... wide wheels and tires also required flares to be fitted to the wheel arches, finished in black to make them stand out even better. 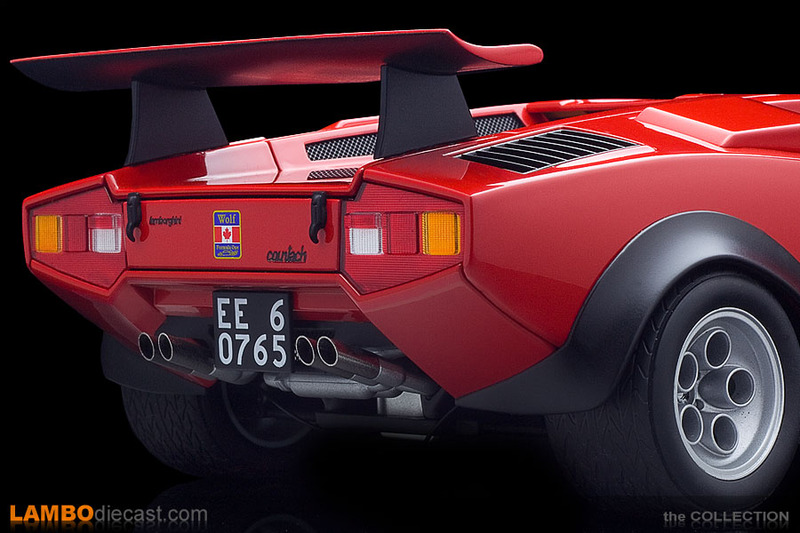 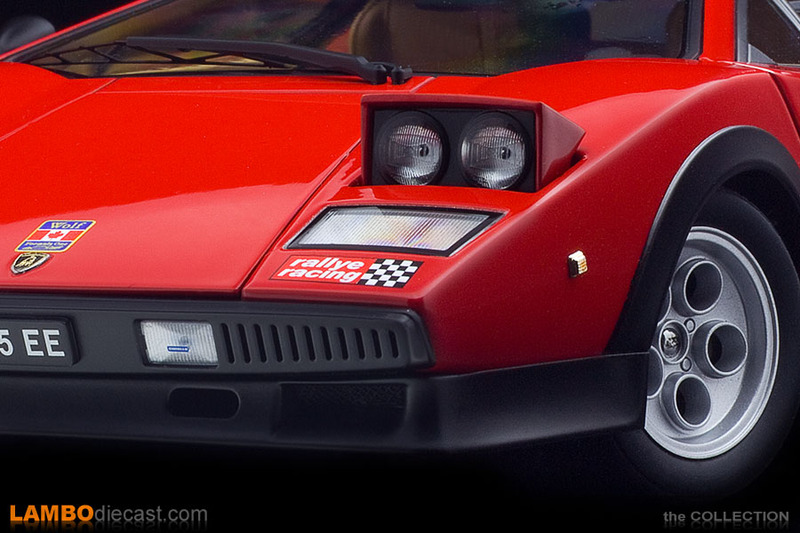 Up front, a deeper chin spoiler was fitted underneath the original LP400 front bumper, and what would become the most recognizable item on any Countach later one was fitted at the rear ... a massive, high rear wing, adjustable naturally on the Wolf car, he was an F1 owner after all, and all of this wasn't just for looks ... Wolf insisted on upgraded brakes and he even had a custom V12 engine made for him, enlarged to 4.8-liter displacement. 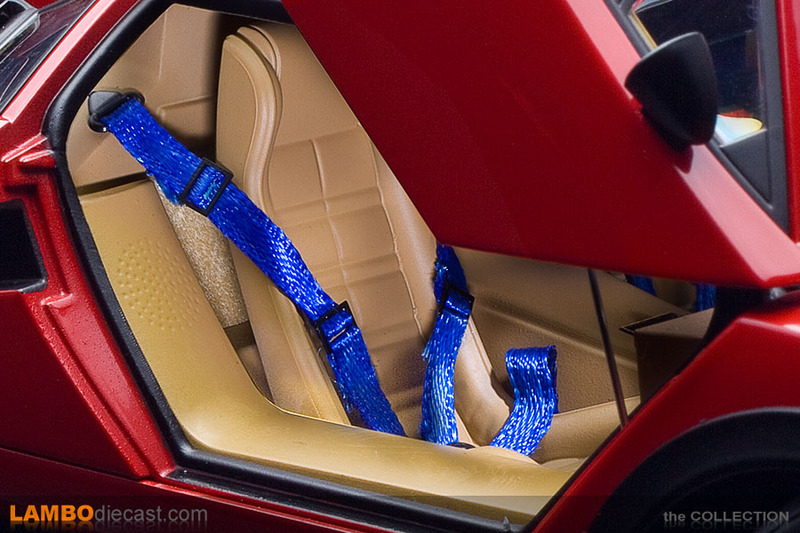 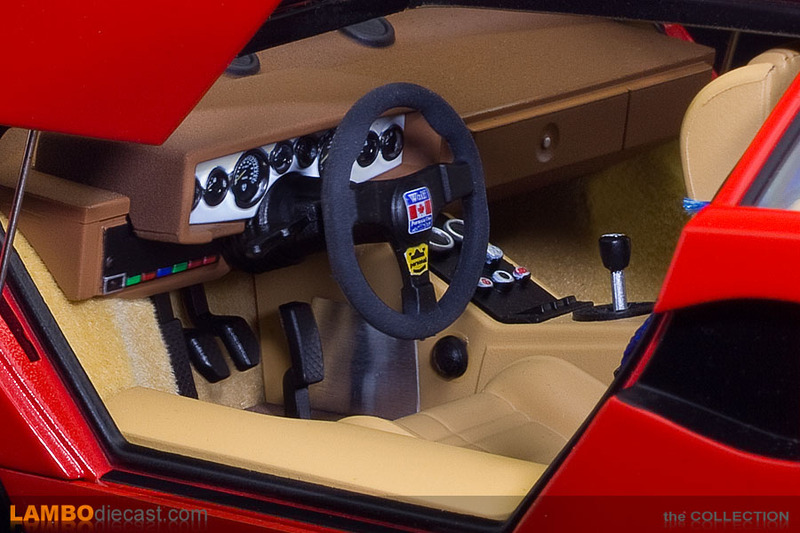 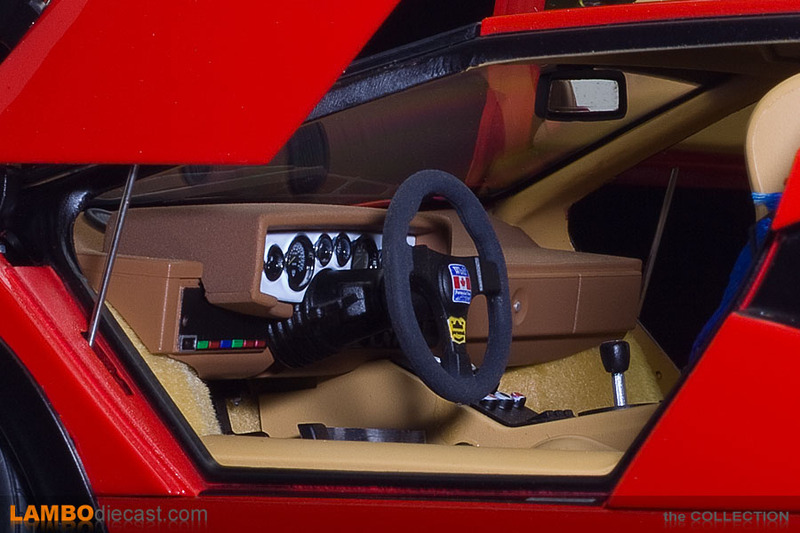 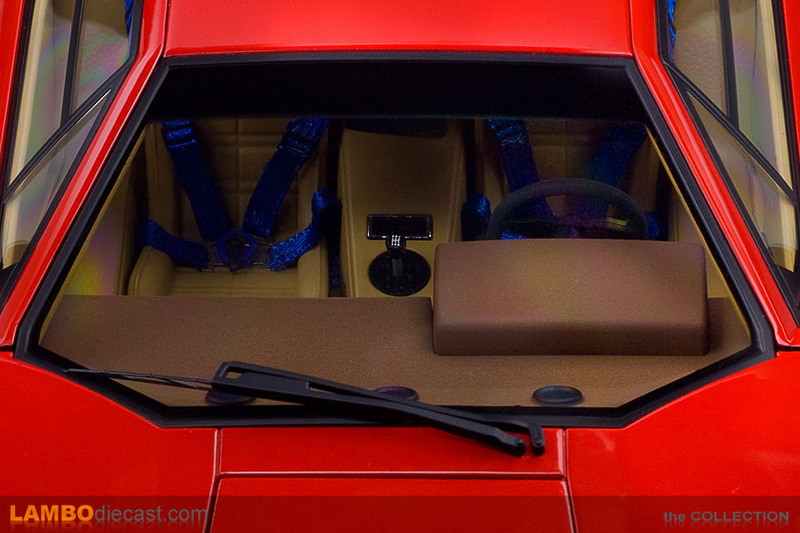 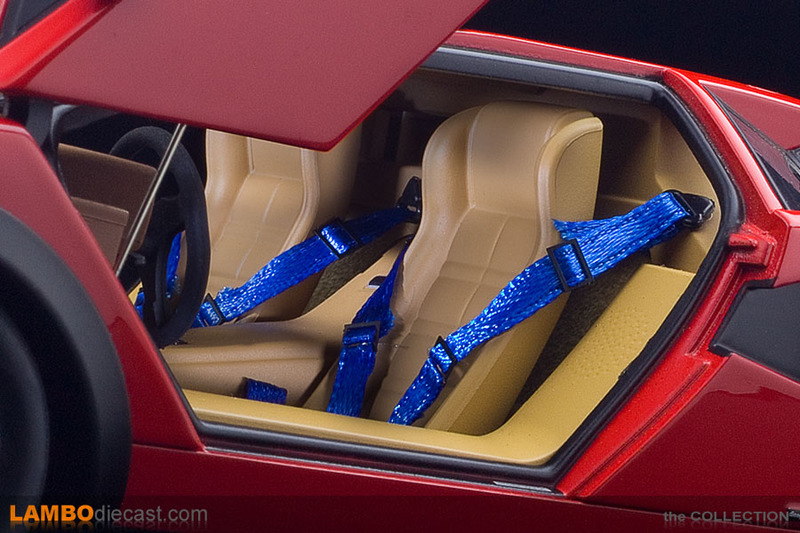 On the inside a custom F1 steering wheel made its appearance while a special plaque was fitted to the door sill showing this car was built specifically for Walter Wolf, a set of blue multi-point, race inspired seat belts completed the interior overhaul for this first factory custom Lamborghini Countach for Walter Wolf ... two more would follow over the next few years. 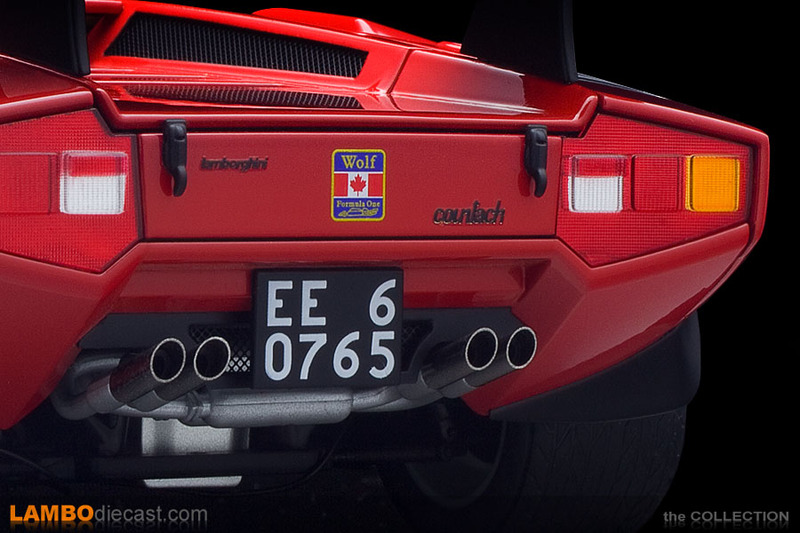 Today this Lamborghini Countach LP400 Walter Wolf is located in Japan, still finished in exactly the same color scheme, and still wearing the special Canadian flag decals, just like Walter Wolf had them fitted back in the Seventies ... save to say, this is one of the most valuable Lamborghini Countach in existence, but do note the engine is now a regular 4-Liter version, the enlarged engine Walter Wolf 'rocked' in his Countach was just a loaner, it was never sold to Wolf and the factory reclaimed it to be fitted in the second WW Countach. 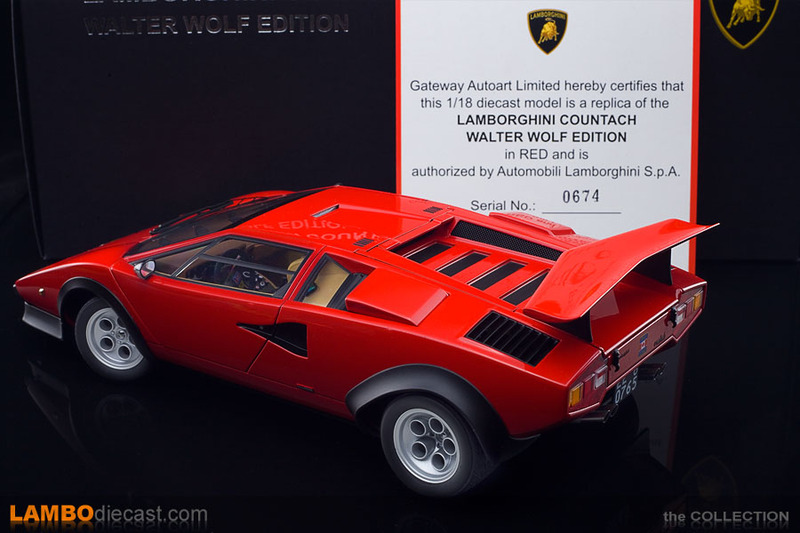 I have owned a Kyosho made 1/18 scale model of this Walter Wolf Countach for many years now, and I'm happy with that one, a few years later Kyosho released a slightly modified version of their model, now with the decals fitted and a Japanese license plate, I have the first edition with no decals nor license plate ... but then AUTOart released two Walter Wolf Countach models, this red one and his second, blue one ... but they come at a hefty price, and because I already had their Kyosho counterparts I didn't really buy the AUTOart versions at first, I prioritized other models ... until I saw a nice discount on this red AUTOart WW Countach ... and then I realized I should have got it a lot sooner. 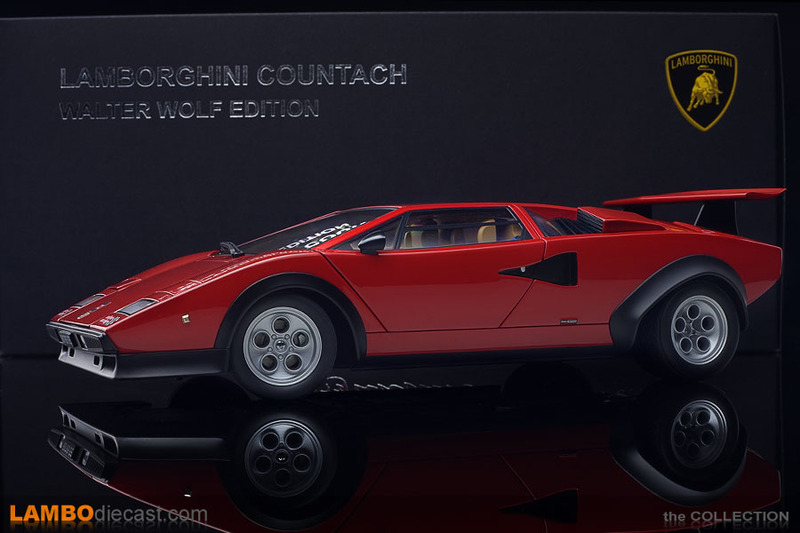 I like the Kyosho Walter Wolf Countach models, I have the original red one but also the original blue one and the more recently released, altered blue one which comes with aerodynamic rear view mirrors ... but this AUTOart version is on another level altogether ... it is so much more detailed, more finely detailed ... AUTOart nailed it with this model, so much so that I'm now looking to add the second WW Countach, the 'Bugatti' blue one, from AUTOart too. 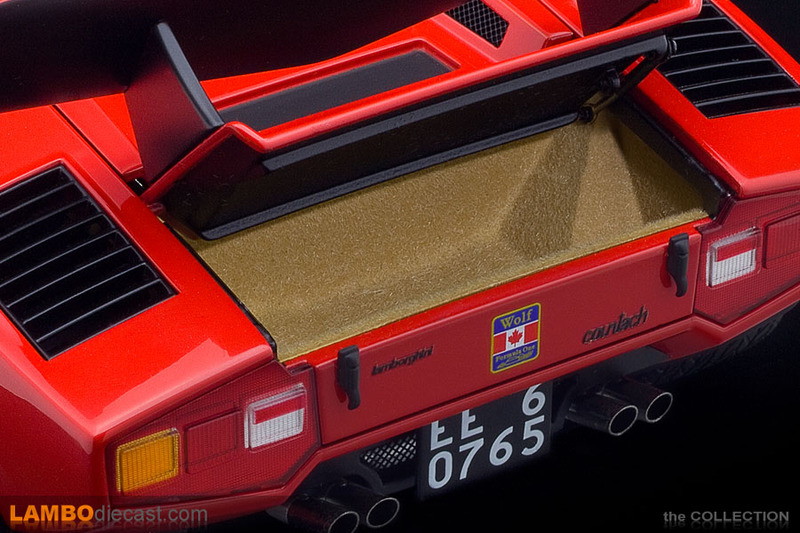 It is nice to see AUTOart fitted the original license plate on their model (EE 60765) and not the current Japanese plates (Kyosho fitted the latter ones), I think that's a very good touch, and another interesting item to remember is the fact this AUTOart model still comes with the numbered certificate, I have number '0674' ... to be honest I don't have a clue on how many of these were made, and if they numbered both this red one and the blue version in the same production batch, but I rather like those certificates, and I really keep them inside the box so they don't fade or turn yellow from the light. 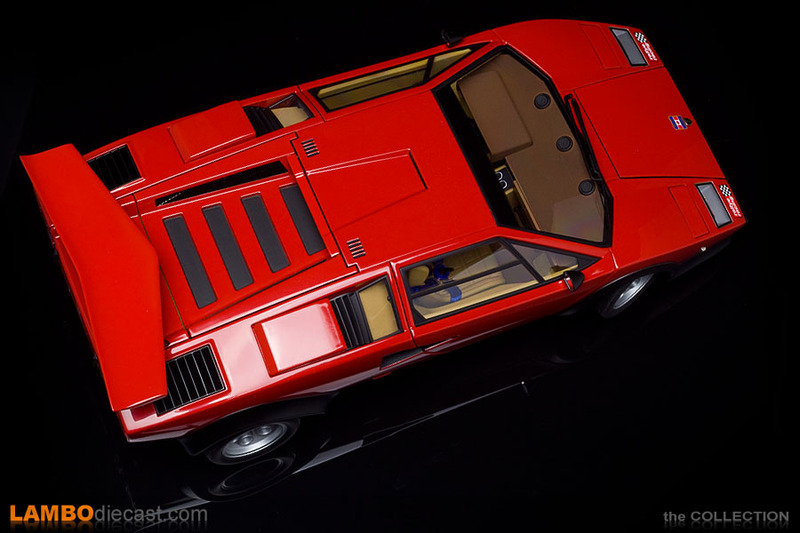 So is this model one you should add to your collection? 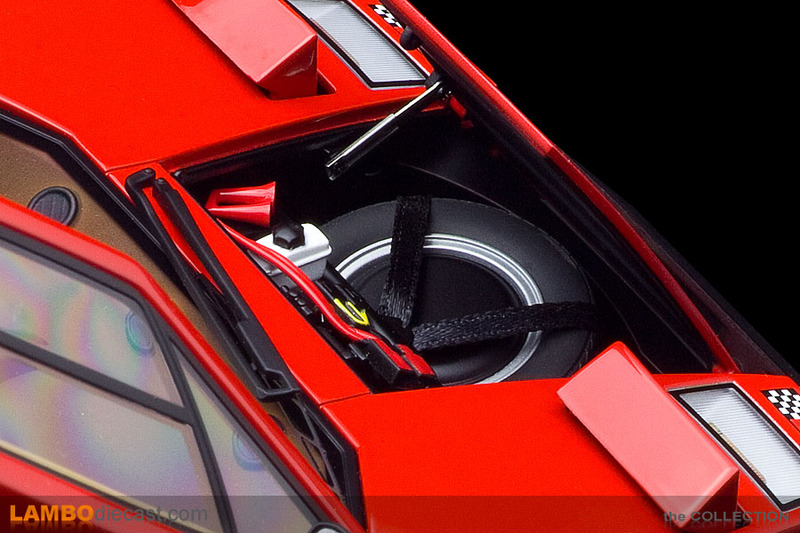 Before I had taken a closer look at this AUTOart version I would say no ... if you already owned the Kyosho counterpart. 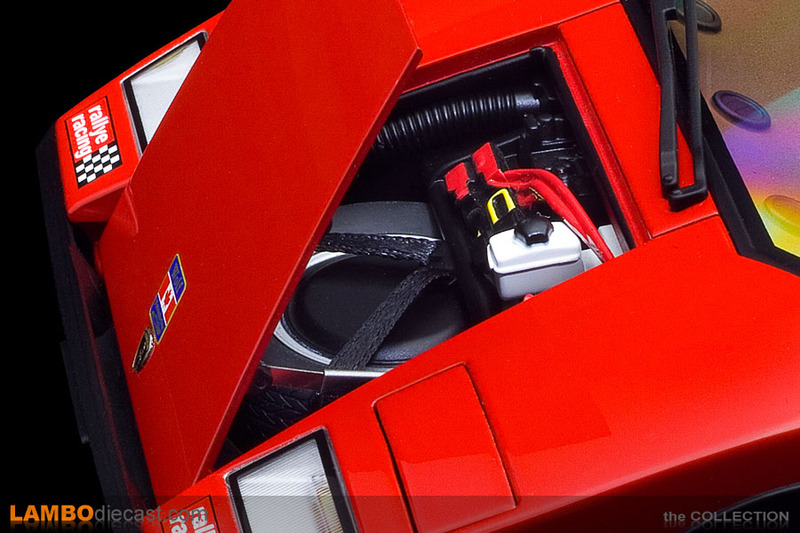 But now, after photographing and studying the model up close, I have changed my mind. 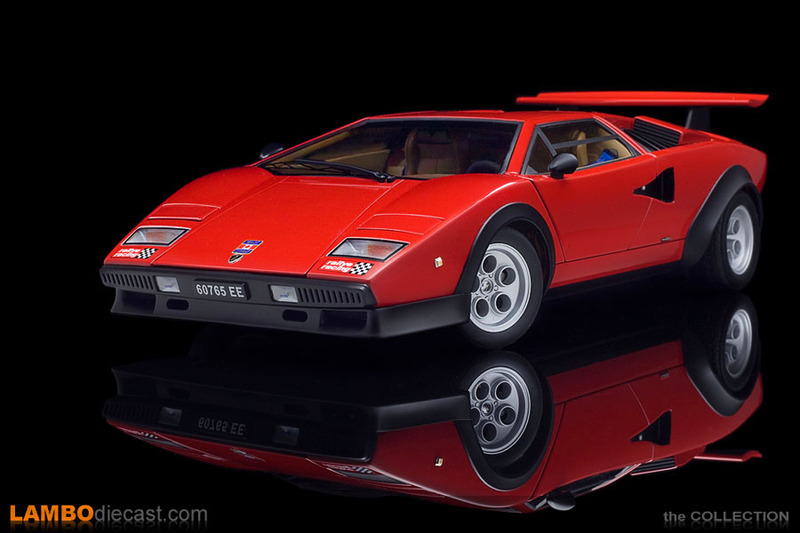 Even if you own the Kyosho model, you should get these AUTOart models too, both the red and the blue one because they are a serious part of Lamborghini history, without the funding of Walter Wolf to design and build the new suspension and install wider wheels ... we might never have seen a production version of the Countach S, or it would have taken a lot longer ... so the Walter Wolf Countach is part of the Lamborghini legacy, and the AUTOart model of them is just so amazing. 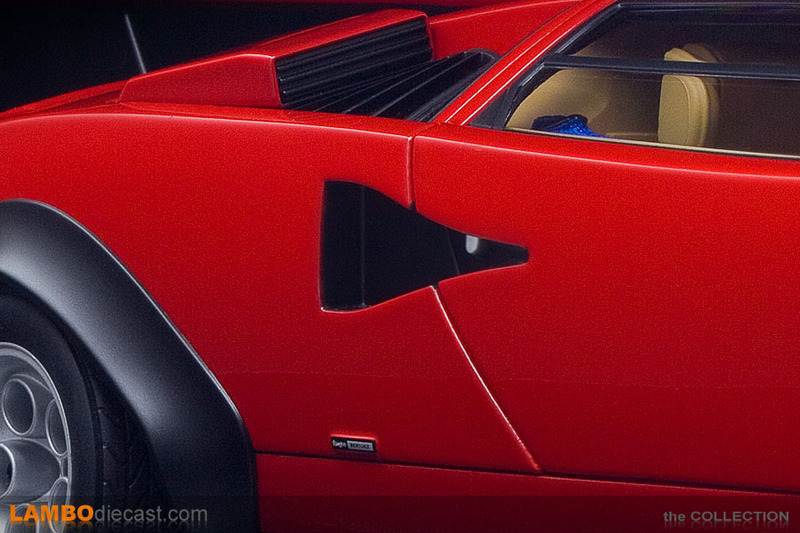 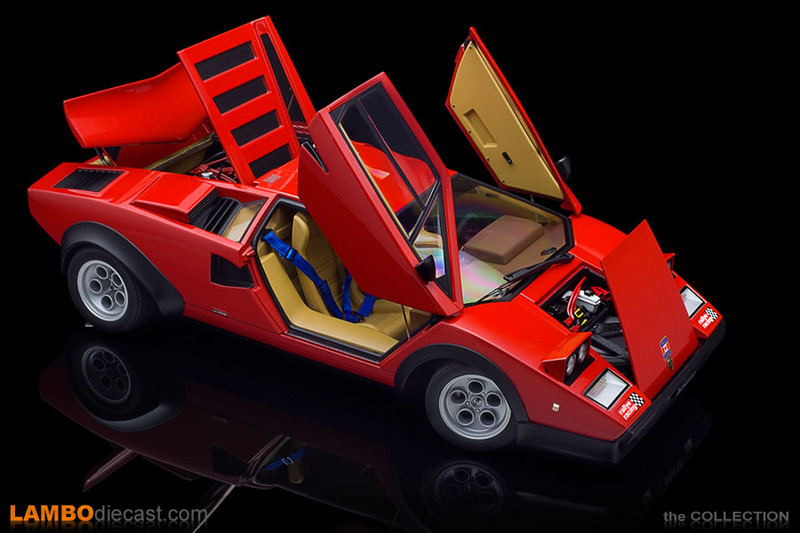 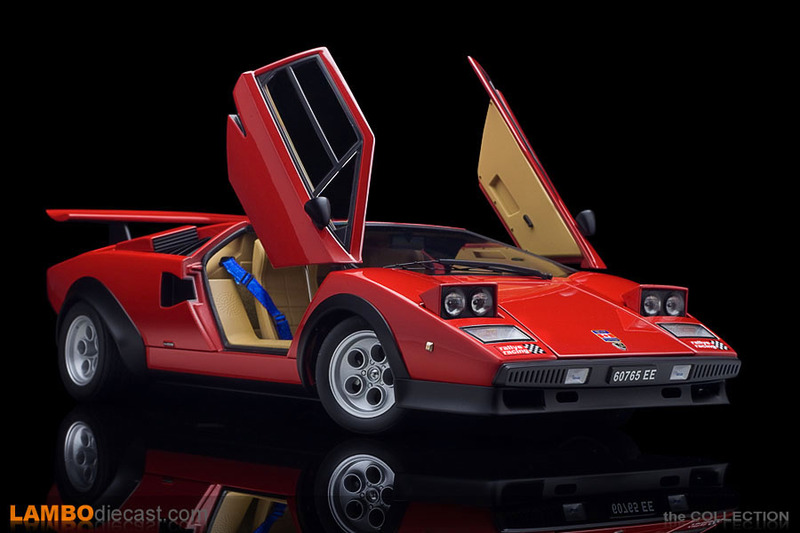 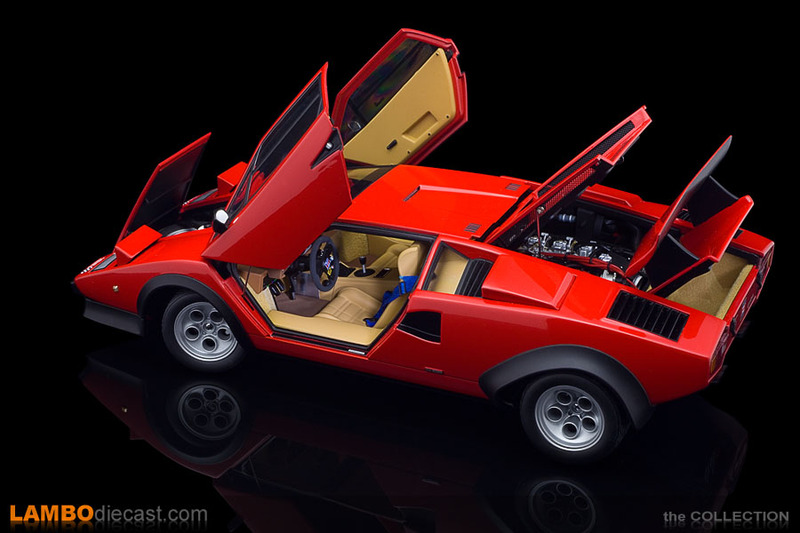 If you don't own any of the Kyosho models for this Countach you should just get the AUTOart version, at this moment the prices on those early Kyosho models are high, most likely even more expensive than the AUTOart ones (while they are still available) ... and the AUTOart model is just better, so don't even doubt which one to get.